As often happens in a plaid, I felt that the darkest colour was too predominant, and that solved my problem of where to put my (Printworks) sentiment. I added the white strip to break up the big solid pink line. This could be a fun colour combination for a baby girl card, too. Or swap out the pink for turquoise for a boy. Adorable plaid! I had a skirt that looked just like your card. Fabulous plaid...and I think I had those shorts :)! Wow, that's the cheeriest plaid I've ever seen! I love the colour scheme, and you're right, the white sentiment band is the perfect way to break up the predominant pink. Beautiful colors, perfectly masked, perfectly aligned and perfectly sponged! You're the master! I had a 'pop' top with the same plaid colors...way back when I didn't worry if a bit of the midriff section peaked out. Gone are those days! Love the plaid! I hear ya about all the post-its sacrificed. When I did my plaid dining room wall, I used about 3 rolls of painter's tape. It's all about the end result! I really love the color combo you chose for your plaid...brilliant design, too! I love the plaid. If I look deep in my fabric stash, I may still have a piece of madras hiding there. Wow, you know how to make plaid, too, Ardy?! Sigh. Next to polka dots, it's my FAVE!! 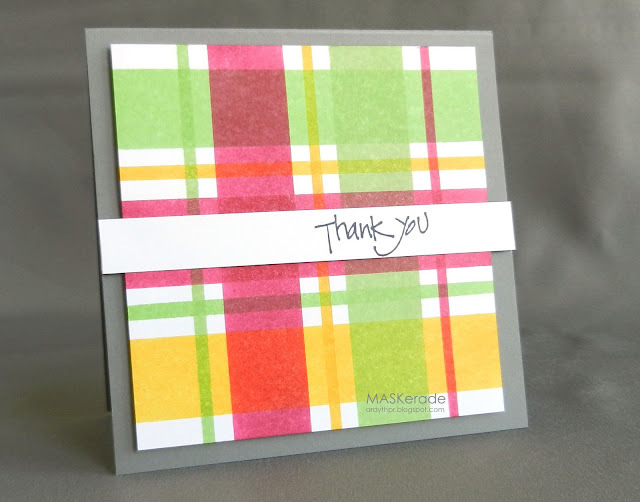 I love this bright plaid and yes it would make a delightful baby girl card!